To choose a pineapple, close your eyes and smell. The sweetest pineapples have the sweetest aroma, and that's the single best predictor of flavor. A pineapple's sweetness doesn't continue to develop after the fruit is picked. Choose large, plump pineapple with bright color, fresh green leaves with no soft spots, decay on the bottom or fermented odor. Pineapples are available year round, but the best prices can be found between April and June. 1). Heat oven to 400 degrees F (200 degrees C). Spray a 9-inch tart pan with removable bottom with nonstick cooking spray. 2). Place cookies in food processor bowl with metal blade; process 10-15 seconds or until fine crumbs form. (There should be about 1 1/3 cups crumbs). Add bread crumbs; process until mixed. Add egg white; mix well. Press mixture in bottom and up sides of sprayed pan to form crust. 3). Bake at 400 degrees F (200 degrees C) for 7 to 9 minutes or until golden brown. Place in refrigerator until cooled. 4). Meanwhile, in a medium saucepan, combine sugar and cornstarch; mix well. Add pineapple and lemon juice; blend well. Cook over medium-high heat for about 5 minutes or until mixture thickens, stirring constantly. Place saucepan in pan of cold water; stir 2-3 minutes or until cooled. 5). 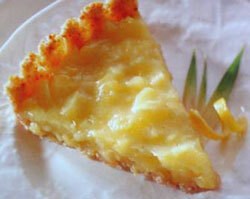 Pour pineapple mixture into cooled baked crust. Place in freezer for 15 minutes or until set. Store in refrigerator.